Hat tip Ravi. "In recent days there has been a storm about the recently announced 2016/17 local government grant settlement from central government. The creation of a new £300m relief fund will mainly be used to help Tory-run councils, like David Cameron’s Oxordshire County Council, with Labour leveling the accusation that this is to buy off Tory MPs. I will leave it to others to form a view on whether this is fair or not. But this whole storm did get me thinking about the scale of the cuts not just for this year, but over the past few years, since the Tories came to power. 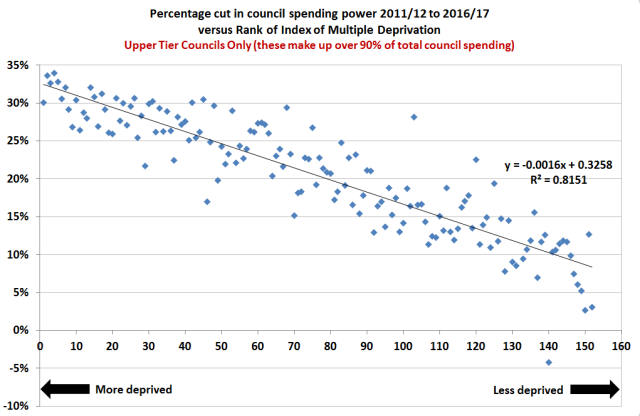 So I grabbed hold of the 2011/12 figures for “council spending power” and compared them to the recently announced 2016/17 figures and worked out the percentage cut in spending power for each council. I picked 2011/12 as a base year this was the first full council financial year the Tories were able to fully influence after being elected. I decided to look only at the 152 County Councils and Single Tier Councils (e.g. London Boroughs, Unitary Councils, Metropolitan Boroughs etc) as they make up over 93 per cent of all council spending. There are 201 district council but they make only about 7 per cent of total council spending. Hence looking only at the “Upper Tier” councils as this made the analysis more focussed. The thing I wanted to test was the theory that the most deprived councils were worst hit. So I took a trip over to the Office of National Statistics (ONS) English indices of deprivation for 2015 website. Here I got the Index of Multiple Deprivation (IMD) average score breakdown by council areas and then used the rank of the average IMD score to plot percentage change in revenue spending power using versus the IMD average score rank. Below is the very telling plot of this data. Note councils with low ranks on the IMD (those plotted to the left) are the most deprived and those with high ranks on the IMD (those plotted to the right) are the least deprived. This graph shows a strong and clear relationship that the councils that are serving the most deprived communities have suffered the largest cuts over the past five years. This very strong relationship is evidenced by the high R2 value (or coefficient of determination) of 0.81. A value of 1 would indicate a perfect fit on the line of best fit, and a value of 0 would mean the data does not fit the line in any way. A value of 0.81 shows a strong and clear fit/relationship. So there you have it: the numbers don’t lie. The poorest and most deprived have suffered the largest percentage council cuts. The poor have been robbed to subsidise the rich. If you want to check the data and my calculations you can download it here."